After years of writing for tech blogs, I’m almost programmed to always hunt for the latest and greatest app or technique for getting work done. But as it turns out, the most productive people often don’t use the shiniest gadgets and apps. Many stick to tried and true hardware and software, and just get the work done. How do I know this? 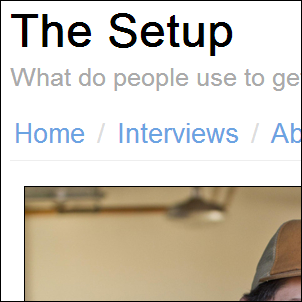 I read The Setup, an fantastic blog which shows how real people get work done. Run by Daniel Bogan, AKA waferbaby, The Setup is simplicity itself: Daniel approaches interesting people and asks them the same set of four questions, every time. These straightforward questions get varied and interesting replies, and never fail to make for an interesting read, especially when Daniel talks to someone like Justin Frankel, Winamp’s creator, or Dana Contreras, one of Twitter’s top engineers. Do you want to know what the questions are? Well, for this piece, Daniel agreed to take some of his own medicine, and let me interview him with his own questions. Staying true to The Setup’s format, there are no fancy screenshots or images here: Just Daniel’s answers. Who Are You, & What Do You Do? Hello! I’m Daniel, a curmudgeonly sarcastic web developer from Australia who lives in San Francisco and works for Flickr. In my spare time I run a silly little website called The Setup where I interview all sorts of random people about what they use to ‘get stuff done’. Which, as it turns out, is a Macbook Pro. See what I mean? This one’s a 2011 model, the one with the decent enough GPU that let’s me run all my Steam games in Boot Camp and spins the hell out of my fans. I have an iPhone 4, which is starting to show its age a little (the battery doesn’t hold charge that well, it refuses to make me coffee). It’s mostly used for reminders (I have a terrible memory), notes, music, Twitter, and very much not talking to people on the phone. I will invariably switch to a 5 in the near future. I also have a third-gen iPad, which is primarily a gaming device and ebook reader. For amateur photos of my dogs I have a Nikon D5000 with some sort of short little lens. 35mm something something. Hum, I really ought to learn more about cameras, really. But I muddle along well enough. Oh, and there’s a Wacom tablet sitting in a drawer waiting for me to stop playing video games and start drawing again. And that’s pretty much it, really. I try not to have a lot of ‘stuff’. I keep most of my life in SimpleNote Simplify Note-Taking & Sync Notes Everywhere With Simplenote Apps Simplify Note-Taking & Sync Notes Everywhere With Simplenote Apps Simplenote and its ecosystem of apps for every platform toss all the superfluous features found in competing note-taking programs and focus on the ones that matter. All Simplenote apps sync effortlessly, with minimal interfaces that... Read More – upcoming interviews and suggestions, things I find interesting, stupid ideas for websites, grocery lists, and the like. I’m using Notational Velocity on the Mac and Listary on the phone for those (both highly recommended). The typical OS X apps (Mail, Calendar) for the basics. Adium for annoying people in real time. Aperture with FlickrExport for tweaking and pushing dog photos onto the Intertubes. TextMate 2 for the codes – we use PHP at work, which is not unlike trying to write calligraphy with a sledgehammer. And I use Ruby for home projects, which is like rubbing two tiny pixies together and trying to fingerpaint with their sparkly magic dust. Or something. Oh, and Crashplan How To Back Up PCs To Each Other Via The Internet Using Crash Plan Personal How To Back Up PCs To Each Other Via The Internet Using Crash Plan Personal Backing up the data on your computer is vital. Yet not everyone does something about it. Why? Because backing up a computer remains a bit of a pain. If you own more than one computer,... Read More for backups. A laptop the size and weight of the Macbook Air but with the beefiness of a Pro would be ideal. And generally, many many less cables. And coffee, forever. What Made You Create The Setup, & What Keeps You Going? I’m struggling to remember how it came about, but I used to host it on my defunct personal site before realizing it might do well enough on its own. As for why it’s still going (which is amazing, as I have a terrible terrible reputation for tearing down sites), I think it’s a little bit addiction, a little bit love. Does It Get Harder Or Easier With Time? Definitely easier. I keep a database entry for each piece of equipment mentioned, so the more the other interviews reference the same thing (which happens a bunch), the easier it is to link them up. Sometimes people will mention some really obscure old hardware, which can be a challenge to find a link for. Sometimes they’ll do that for me. Do You Find Most People Are Willing To Talk About Their Setup, Or Do You Get Many Refusals? The majority are happy to, which is nice! I keep aiming ridiculously high, so I do get shut down a bit with those, but I’ve also been rejected by people who generally object to the idea of glorifying their stuff, or just aren’t interested. Which is fine too. Seeing As How The Blog Isn’t Financially Motivated (Right? ), What Do You Personally Get Out Of It? A far healthier hobby than playing all the video games until I go blind. The Setup keeps things simple (which is a big part of the appeal of the blog, for me), but it does have one interesting feature: It lets you find interviewees by category. Meaning, if you’re curious to know what sort of hardware and software a comedian uses, you can just go to the categories page, click comedian, and find three different interviews with comedians (Aaron Bleyaert, Avery Edison, and Tom Scott). You can also browse interviews by year, which is nice. In a tech world engaged in an endless pursuit of the newest thing, The Setup is a breath of fresh air for me. It serves as a valuable reminder that old stuff is great too, as long as it works, and that the important thing is getting the work done – not using the shiniest tool. very good interview. it's nice to see a little bit of who's behind The Setup. I'm a brazilian fan of The Setup. A fascinating look at real working people. I guess it goes to show you that being creative is all about being comfortable. This man interview many great people, Winamp maker, CCO, designer, developer, etc..
A great web to get information about success people. Very recomended. Thank you for pointing me in the direction of the setup. I have a 4 year old desktop that has been in open heart surgery on my desktop for the past two years. I load up whatever OS is needed at the time and I am often trying new systems. My setup is functional, if it works I am happy enough. I used to marvel at the new, but time makes you comfortable with what you have got. I upgrade when I need to, and no longer when I desire to.